Cooking apron in Winter Solstice design, in a choice of two colours. Combines Scandinavian shapes and colours with Eastern European folklore patterns in a 1970s style. Inspired by retro Christmas tree baubles. 60cm X 80cm, 100% cotton apron with pocket. Mix and match with the Solstice tea towel and oven gloves for a full kitchen set. 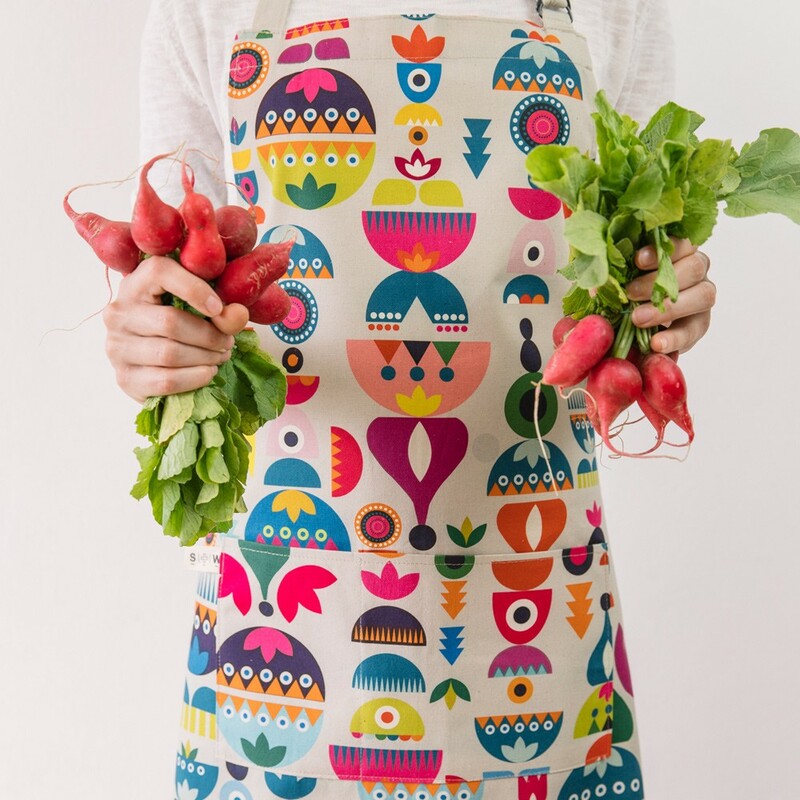 Part of this collection by Softer + Wild, Solstice cooking apron marries Scandinavian shapes and colours with Eastern European folklore patterns to create a charming style that brings thoughts to the early 1970s. Why not add matching Solstice tea towel and oven gloves for a full kitchen set. If you’re looking for aprons for women in your life, this could be just the ticket. Available in two colourways. The cotton fabric in this baking apron is hard-working. Use it often and don’t be afraid to wash it (gently), and it will remain faithful through all your cooking. To see the full collection by Softer + Wild, click here.